Ben F. Dixon III, 83, a retired Foreign Service officer and Washington lawyer whose posts included those of politico-military affairs counselor to the U.S. ambassador to Pakistan and foreign policy adviser to the Coast Guard commandant, died March 15. 2002, at his home in Washington after a heart attack. Died on March 15, 2002. Of Washington, D.C. Beloved husband of the late Frances McKee Dixon. Father of Ben Franklin Dixon IV of Chevy Chase, Maryland, Marguerite Dixon Ayers of Baltimore, Maryland. Brother of Wright Tracy Dixon Jr. of Raleigh, North Carolina, and Mary Ann Dixon Hogue of Wilmington, North Carolina. 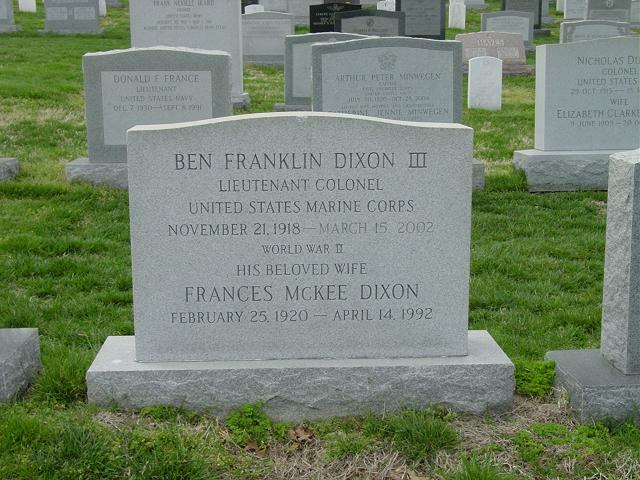 Grandfather of Frances McKee Ayers, Eliza Benz Ayers, Susan Flannery Dixon, and Ben Franklin Dixon V.
Thursday April 4 at 1:30 P.M. Interment to follow at Arlington National Cemetery. In lieu of flowers memorial contributions may be made to the Tangier American Legation Museum Society (TALMS), C/O Stephen E. Eastman, 44 Little Pond Road, Merrimac, Massachusetts 01860, and Christ Church Georgetown Restoration Fund, 3116 O St NW, Washington DC 20007.